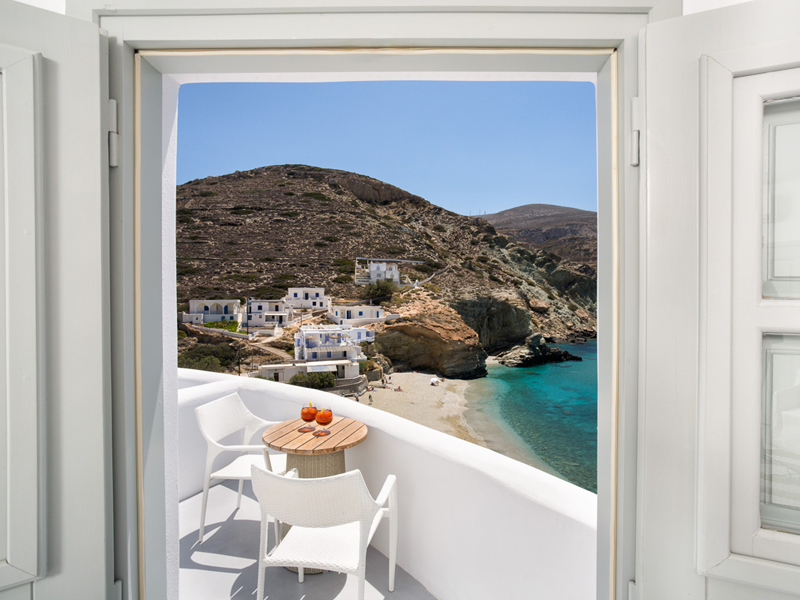 Eight miles long, 3 miles wide, with just 1 main road snaking through it, the sleepy island of Folegandros is Greece at its simplest, and perhaps most alluring. No buzzy nightlife or over-touristy attractions here; just crystalline waters, one of the best-preserved villages in the Cyclades, traditional cooking and sunsets that rival Santorini’s. If you’re looking for authentic, Mamma Mia-style Greece, this is it. There are 3 main villages. Karavostasis is the island’s port town – little more than a fishing village but it has some cute seafood restaurants and a pebbly beach. Ano Meria is a cluster of old farmhouses, stone-lined crop plots and ancient ruins that sit atop a hill; it has an interesting Ecological and Folklore Museum that documents life on the island throughout the centuries. And Chora is postcard-perfect, with a medieval castle and whitewashed houses set around squares draped in bougainvillea. Tavernas spill onto streets, locals play backgammon in the bars, and mesmerising views of the Aegean are straight ahead. The best sunsets in Greece? 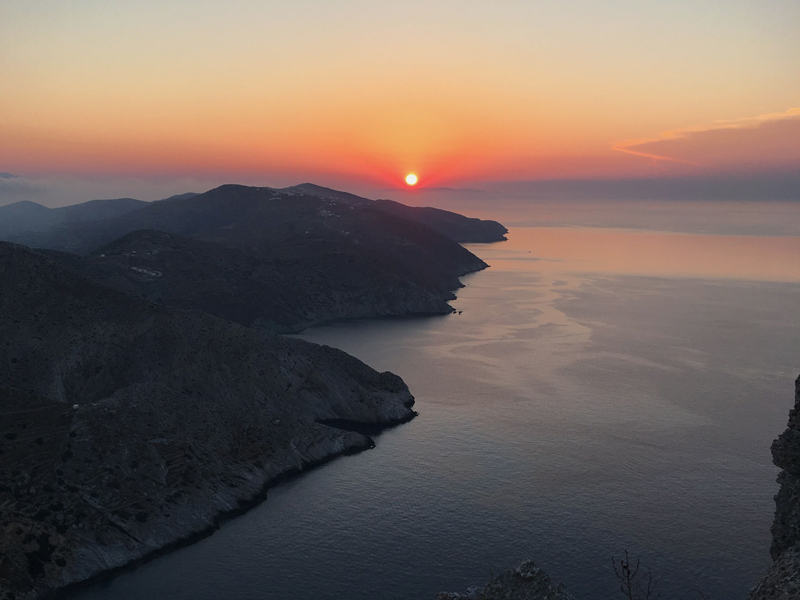 The Greek islands are famous for their sunsets, but few can match those on Folegandros. Remember that scene in Mamma Mia when they follow a winding path up to an adorable little church? 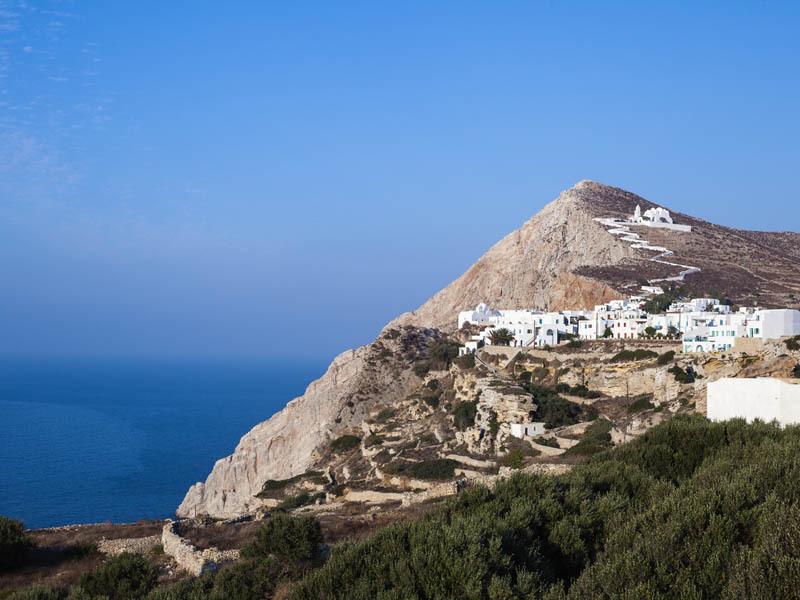 Just on from Chora you’ll find Folegandros’ very own version: the Church of Panagia, which lords over the Aegean from a lofty peak and has breathtaking views of the island. The twisting, 15-minute climb up to it feels gloriously romantic, and the lack of crowds makes it all-the-more special. 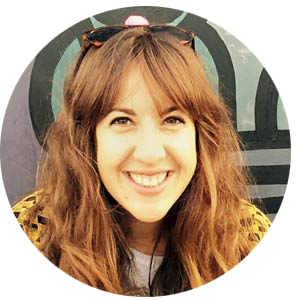 Top tip: take a drink up with you to toast the sinking sun and blazing orange sky. 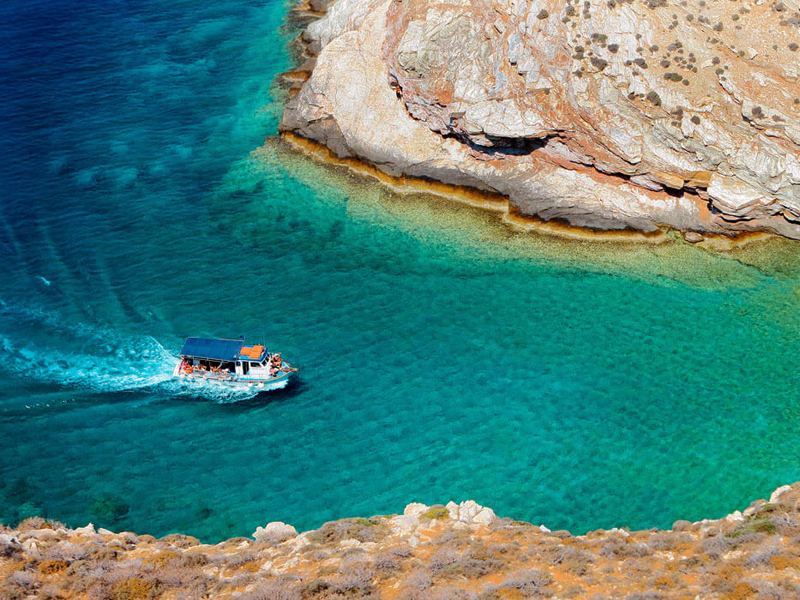 Thanks to no mass tourism, the sea surrounding Folegandros remains undisturbed. Thus marine life thrives and the water is clear as glass. Some of our favourite spots to snorkel are Georgitsi Cave – close to Livadi beach and inhabited by anemones, sponges, hermit crabs and lobsters – and Agios Nikolaos beach, home to the Blue Caves. 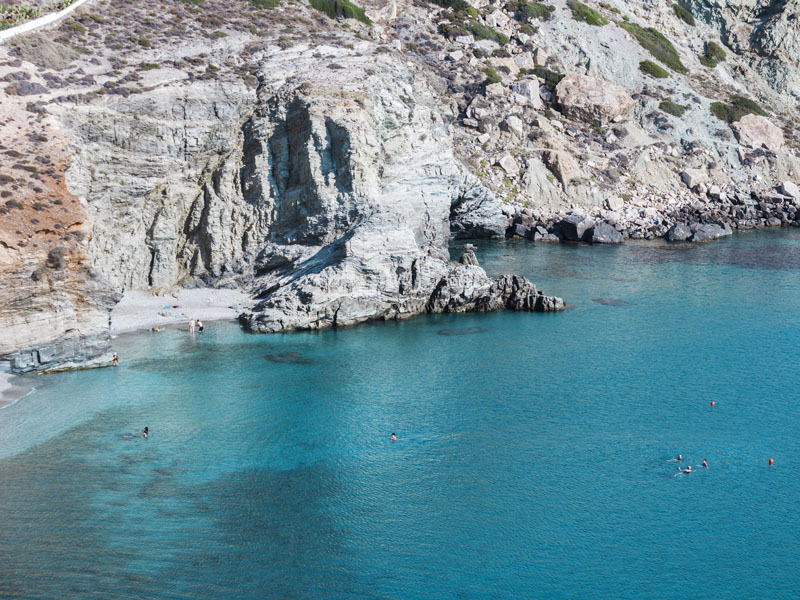 There are daily boat trips that call at secluded beaches and some of the best snorkelling and diving spots in Folegandros – Sea U Diving Center in Chora is recommended by our friends on the island. You can’t go wrong when it comes to eating out in Folegandros. Generally, fresh fish, crunchy salads, local cheeses and souvlaki are what’s on offer. A Folegandros speciality is matsata: homemade pasta ribbons in tomato sauce with either rabbit, goat or chicken. One of our best meals was at Papalagi Seafood Restaurant, where the views were astounding and fresh fish ceviche was perfectly paired with ice-cold wine. 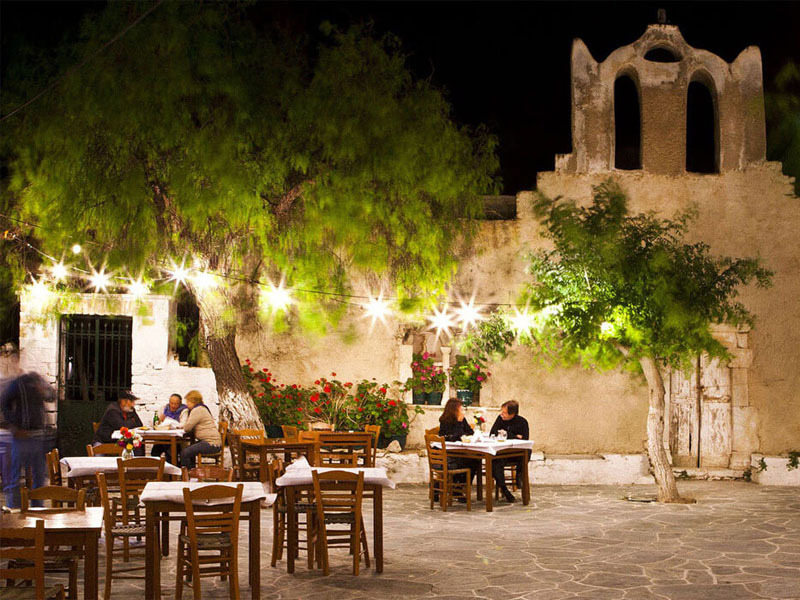 In Chora, we picked Chic, with little wooden tables magically lit by fairy lights. The mezze dipping plates and the lamb and prune stew was delicious. We adored Blue Sand Boutique Hotel. It overlooks Agali Beach and is stylish, yet relaxed and very romantic, with some of the best beaches on the island nearby. 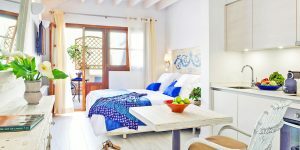 If you want to be closer to the action, Anemomilos Boutique Hotel in Chora is a delight, with extremely friendly owners, balconies with killer views, and tavernas on its doorstep. 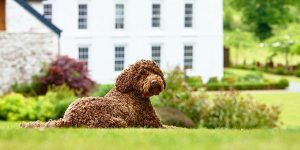 It’s super popular so you’ll need to book well ahead. Five-star Anemi Hotel in Karavostasis has suites with private pools, a yoga studio next to a vineyard and a restaurant serving some of the best food on the island. The island is tiny so there’s no airport (which keeps charter flights away). You’ll need to travel via high-speed boat, either from Athens Piraeus (4 hours) or Santorini (1 hour); both have international airports. Once on the island, you can get around on the bus (it calls at the main villages). It stops running fairly early though, so if you want to head out for dinner you’ll need to get a taxi or rent a car. A popular way to explore the north of the island, which doesn’t really have any tarmacked roads, is by moped – ideal for a day of beach hopping.